COMEDY. Property is a contemporary romantic comedy set in a Garden District mansion in New Orleans. A young artist, Rooster Dubonnet, suffering from a terminal disease, is dazzled by love. Rooster, who has been raised by an imperious society-driven mother (Irene Dubonnet), falls in love with a New-Age nurse with ideas of reclaiming one's vitality without medicines. Property explores the false standards of society that make it difficult for artists to develop their talent. The play studies how far a human being will go to reclaim love. The play's title, Property, resonates the question of how property is used to bait chidren into caged behavior. 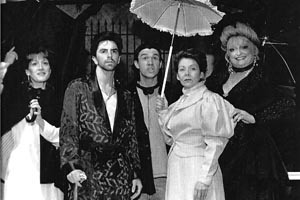 Characters represent different forces of New Orleans life: the society mother, the artist son, the New-Age nurse, the drunken nephew, and the spinster companion. All of the characters seek ways to live in the Garden District without paying the price. The companion, Oozie, and the drunken nephew Bunky - do not make life/death choices but drift through life. Property challenges the characters to prioritize love and goodness in a culture that champions money and greed. The play is set during Mardi Gras when a whole tradition of fun, revelry, and prestige seizes the city. A young man is caught between his dedication to his family's past and his own very different future. Satire intensifies at carnival when old and new traditions consume the family. Unit set. Irene Soniat Dubonnet: Fifties: A landowner, she redefines the word style - in designer dresses, and flawless makeup. Irene is one of those striking women - nerves of steel, iron lungs, sharp as a tack - who has nothing to do but protect her grown children, and she watches them like a dog guards her bone. Rooster Dubonnet: (Nicknamed Roo) Late Twenties. A painter who has pushed himself beyond reasonable limits. He is critically ill from cancer. The disease gives him a distinct nonchalance, the charm of the damned. Bunky Dubonnet Legere: Early Twenties, her grandson. He dresses like a rebel. His consuming interest is singing the blues. When he drinks, his personality changes into exaggerated gaiety and hair-trigger rage. Oozie Ransom: Twenty-five to fifty. Companion to Irene. Oozie is always fixing herself - freshening her lipstick, puffing her hair, buffing her rings. Monica Falcon: Late twenties. A nurse, attractive, with a passion for things of the spirit. He gentleness is matched by delicate features: fine skin, graceful hands, hair, which tumbles around her face. TIME Valentine's Day to Mardi Gras. The not-too-distant present. SCENE The day room of a Garden District mansion, New Orleans, Louisiana.